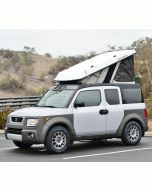 The stock ECamper has a gloss white roof to keep the sun from heating up the sleeping area. Painting it to match the Element is one of our most popular options. The top is painted with the same three stage paint used for insurance or body repair, allowing accurate matching of the metallic and flake colors used on various years. Painting will be based on the paint code for the vehicle, if you are not 100% sure of the factory color please check the sticker on the inside of the drivers side rear door (see photo) and provide this information via email prior to conversion. You can select the option for paint match "will provide" if you are ordering via the internet and are not certain of the exact color, or if you haven't bought the Element yet. For black Elements, it is highly recommended to utilize the standard white color for the cap to reduce the heat build up on the roof and sleeping area on sunny days.